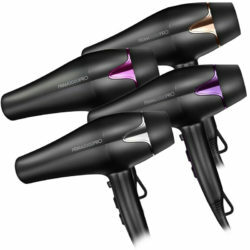 WINNER of InStyle Best Beauty Buys ‘Best Hairdryer’ 2011, 2012, 2013 & 2014. The PARLUX 3200 COMPACT reflects the already known and appreciated characteristics of Parlux: long-life, power and well-balanced for a more comfort use. It is very powerful in a ”Compact” Size. Airflow of 69 cubic metres hour. COMPACT / LIGHTWEIGHT: Weighing under 550grms. Measuring only 20cm. The 3200 Model features the new Revolutionary “K Lamination” motor which is lighter, more durable, and very powerful. Available in Black, Silver, Raunchy Red, Dinky Pink, Chocolate Spice and Purple Haze. Also available in a Flower Edition (Black or White).